Have you ever ironed a pair of dark pants only to have small white flakes fall out of the iron’s steam holes and make white streaks across your clothes? This is especially a problem in older irons that have never been cleaned. Your iron is in many ways like a commercial steam boiler. After a long time making steam, a boiler can clog up with white flakes and get trapped in the boiler system. This white buildup in both the steam iron and the boiler is a layer of calcium and other minerals called scale, or sometimes limescale. As the water evaporates, the minerals in the water don’t turn into steam when the machine is in use; they are left behind to form scale inside the equipment. 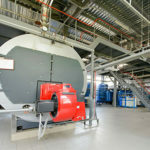 As annoying as those little white flakes are for your dark pants, imagine what those deposits do to the heating elements of large industrial equipment like boilers and heat exchangers. On some equipment, the scale buildup can be inches thick. An inch, or even a much thinner layer of scale is more than an annoyance, it’s a serious maintenance problem that diminishes system efficiency, reduces heat transfer, and increases operating costs. Just like maintaining and cleaning your steam iron, facility managers have to do the same for their heat exchangers and boilers. 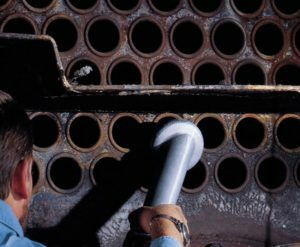 The U.S Department of Energy’s (DoE) April 2012 Tip Sheet #7 discusses the effect of scale buildup in fire tube boilers. Mineral scale can coat the waterside of the boiler tubes and act as an insulator between the metal tube and the water. The boiler then has to burn more fuel to transfer heat through the insulating scale layer. 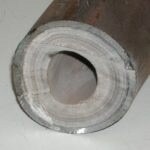 The DoE tip sheet gives the example of a 450,000 million Btu boiler with a 1/32nd inch layer of scale on the tubes that results in a 2% fuel loss. The boiler has to run longer to overcome the efficiency loss from the scale and, over an 8,000 hour runtime, the boiler will use $72,000 more in fuel compared to a boiler with no scale build up. That 2% efficiency loss from scaling seems so tiny on paper, but over time that 2% translates into a very significant sum of money. 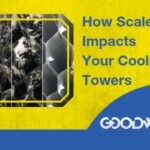 To see how much scale could be costing you, Goodway has calculators available on their website. 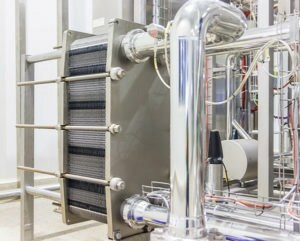 Plate heat exchangers are another common piece of HVAC equipment that can suffer from scaling. 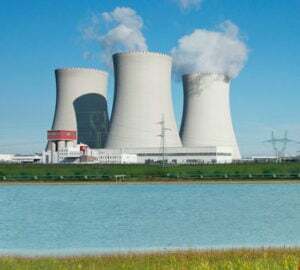 As hot and cold water flow through the exchanger transferring heat through the metal plates, the hot water side of the plates become coated in mineral deposits. A study by Alfa Laval looked at the scale buildup on heat exchanger plates operating for one week with untreated tap water. After just one week, the plates are literally covered in hard scale. The pictures in the study are quite stunning when you see the thickness of the scale deposit after such a short period of time. Imagine the level of scale after two weeks or even one month. It would not take long for the scale to totally stop the flow of water and ruin the equipment. 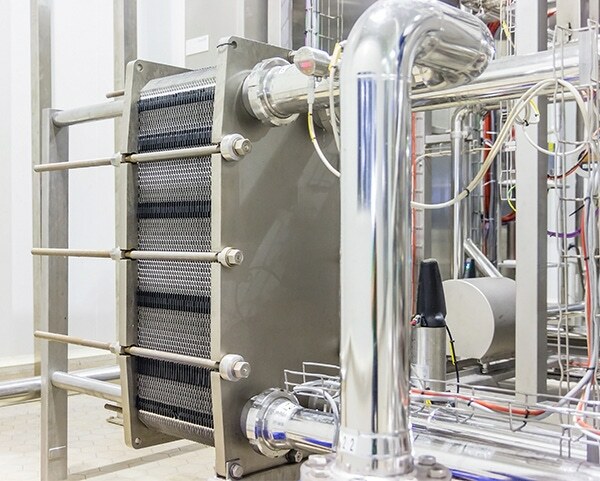 Scaling impedes boiler and heat exchanger performance not only in the loss of heat transfer and the resulting increase in boiler fuel usage, but the proper function of the entire water system suffers. As scale builds up in the heat exchanger there is less free area the water can flow through increasing the pressure drop across the heat exchanger. To achieve the required flow to make the system function, the pump has to work harder and harder to push water through the narrowing pathway. This extra pump work means more wear and tear on the pump and more energy usage and that yields higher utility bills and more frequent pump repairs. 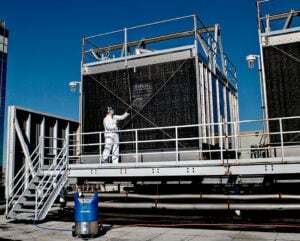 Just like air-side equipment (air conditioning units, VAV boxes, fans), water-side equipment (boilers, cooling towers, heat exchanges) have to be regularly maintained. Part of water-side maintenance is cleaning and descaling. Armstrong Limited, one of the largest manufactures of water-side equipment, suggests in its heat exchanger operations manual that “[c]leaning of fouled plate heat exchanger by back flushing will remove most of the soft debris that is blocked inside. The solution used for back flushing shall be weak acids with concentration less than 5%; one example is citric acid.” Bell & Gossett similarly lists citric acid as a recommended base for descaling its gasketed plate and frame heat exchangers. A diluted citric acid cleaner is the ideal chemical for scale removal. Facility managers and maintenance staff should always maintain and clean their equipment per the manufacturer’s recommendation. Goodway’s scale removal systems and ScaleBreak-MP Liquid Descaler are good options for descaling water-side equipment. ScaleBreak-MP uses citric acid as its base, is biodegradable, and contains no hydrochloric acid. The Goodway GDS-100-BV Scale Removal System is a portable and powerful cleaning system that allows facility managers to backflush their equipment in line with manufacturer’s recommendations. Goodway also offers smaller scale removal systems compatible with its other descaling chemicals like ScaleBreak-SS for stainless steel equipment. Scaling can seriously impede the performance of water-side systems, but with proper maintenance the scaling can be removed and equipment continue to work as designed.